So, when I opened the carton that arrived at my home and found the air fryer there, I did not know what to think of it. My cousins were already using the air fryer and apparently, you can cook a lot with it. Now, I had to cook something in it which I could carry it to office for my colleagues who had gifted the appliance. I knew that only one thing could please them – a whole roast chicken. And it came out really well! I had not expected it to be so easy and fast, roasting a whole chicken in an air fryer as opposed to my sturdy OTG where I usually do it. Soon, I was using my air fryer more often, trying out a lot of recipes. But my best still remains the whole roast chicken. I have been trying out a lot of roast chicken recipes and I feel brining brings out the most flavor in the chicken. While there are different brining methods, I chose one of the simpler ones. Wash the chicken and pat dry. For the brining, combine the brining ingredients and dunk the chicken in it. I left it covered overnight in the fridge. After sufficient brining, take the chicken out of the solution and wash it thoroughly. Then mix all the sauces – tomato sauce, soya sauce and Worchestershire sauce and apply this mixture thoroughly on the chicken, particularly below the skin and in the cavity. The skin separates easily from the chicken if you carefully insert your fingers and break the fatty layer. Push the butter and dry seasoning spices (I used an Italian seasoning mix from the brand Only) below the skin and inside the cavity, but take care not to break the delicate skin. Marinate the chicken uncovered, for an hour, in the fridge. Now, take the chicken out of the fridge and let it come to normal temperature. Pre-heat the air fryer at 180 degrees for 10 minutes. Place the chicken in the basket of the air fryer and roast for 20 minutes, based on the size of the chicken. Flip the chicken after the 20 minutes are over and cook for another 20 minutes. Once the time is up, let the chicken sit for around 15 minutes. By then, there would be superbly crisped up skin and a pool of amazingly flavoured sauce at the bottom of the basket. Slice up the chicken, drizzle this dripping/sauce over the pieces and you are good to go! Do take care to see if the chicken is cooked fully through. Insert a knife around the thigh region of the chicken check if the juices run clear. If not, cook for another 10 minutes or till the chicken is done. The brining ensures that the chicken does not become dry and remains absolutely juicy and moist. I am usually not too fond of the breast meat in a roast chicken but even that part of the chicken remained tender and succulent. Do try this recipe and please mail me or post your query in the comments section if you require any help. Take care! PS: I also roasted some potatoes to go along with the chicken. Just boil a few potatoes, cut them into quarters, sprinkle some salt and seasoning mix, drizzle some chicken juices and let it roast in the air fryer for around 20 minutes. Give a shake to the potatoes during half-time to ensure even cooking. That’s it! 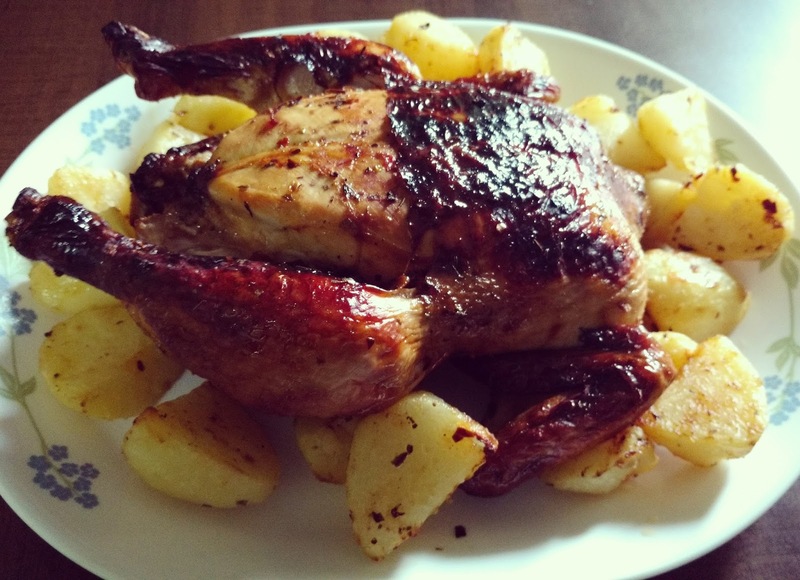 PPS: My other recipes for roast chicken can be found here. Looks good... was there enough space for tge chicken in the basket...and did you flip it over once??? Could you use the dripping to make rhe gravy??? Yes, sufficient space is there in the basket. Even I had that apprehension but the chicken fit in quite well. I did flip it once, after 20 mins, and then kept for another 20 mins. The drippings get collected down and it is actually very convenient to pour it out to make a gravy.